Pinky Chouhan had a dream of working in a beauty parlour. “Every time I went to a beauty parlour and saw someone working there I would dream about working in a parlour someday. The procedures they conduct at beauty parlours intrigued me and I was very much interested in them. Besides, looking beautiful or making someone look beautiful always interests me.” She says. Pinky belongs to a simple family and her father is a mason. Despite having big dreams, she was a shy girl. However, she got an opportunity to fulfil her dreams when someone informed her about the Livelihood College. The Livelihood College is an initiative to turn Chhattisgarh into a hub of skilled manpower. Every district of the state has one Livelihood College. These colleges impart skill education to young men and women form various parts of the state. This initiative is in tune with Prime Minister Modi’s vision of turning India into a global supplier of skilled manpower. The Livelihood College, with its various courses is fulfilling that dream. The professional courses offered at these colleges are industry oriented and the objective of these courses is to help the youths get employment in various industries. 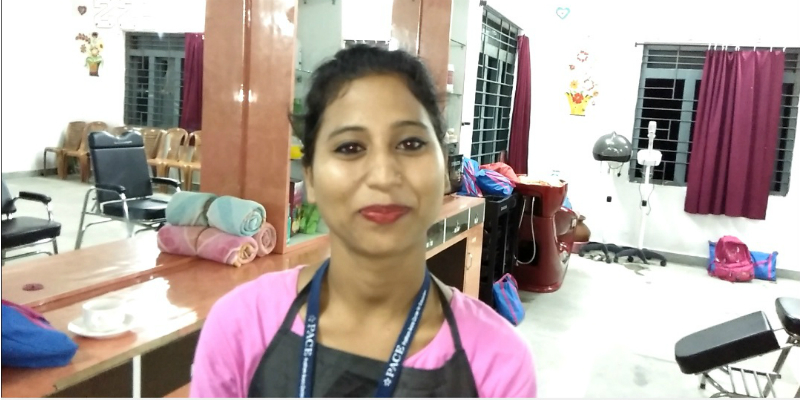 When Pinky learnt about the Beauty & Wellness course in the Livelihood College of Jashpur, she decided to go there. Pinky had to go a long way from Raigarh to Jashpur to get admission into the course. But staying away from home was not a big problem for her because the Livelihood College was a fully residential college. The study materials were also provided to her and other students free of cost. Pinky has learnt the important aspects of Beauty & Wellness industry. “We have learnt a lot of things. The various aspects of the Beauty & Wellness industry and different procedures are taught here. Now I ama confident that I can manage any work related to Beauty & Wellness. I will be able to work in a beauty parlour without any difficulty. It has been my dream to work in a beauty parlour and I am not far from my dream.” She says. Pinky has also learnt how to communicate effectively and confidently. “My confidence level has increased tremendously and I am a better communicator now. Earlier I was very shy and was low on confidence. I would have never been able to talk in public without this course. This course has change my personality and it is one of the greatest benefits I have got from this course.” She says. Pinky is eager to finish the course so that she can start working. The Livelihood College also offers placement assistance and she is confident that she will get a job soon. She is also eagerly waiting for the job because she wants to enjoy the feeling of being independednt. She wants to contribute to the family instead of being independent on them. Her dreams are being shaped in the Livelihood college and she is grateful to the college for that.